There have been many improvements made to our city just before the Republican National Convention, but how well is the clean-up going around town? 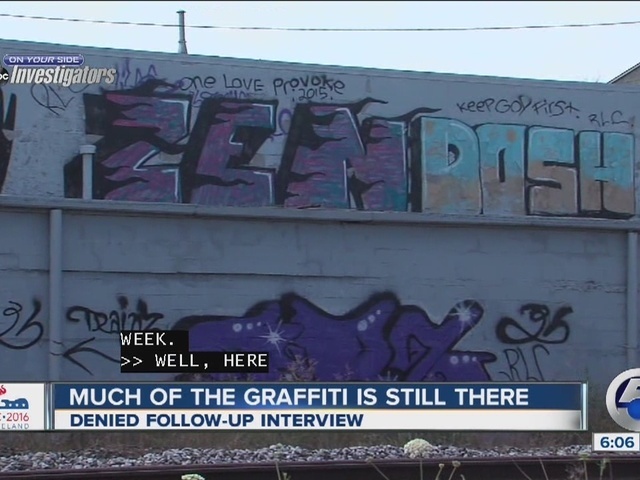 We followed up on our story that aired 7 weeks ago to check on what progress has been made with graffiti, overgrowth and trash. "It's very exciting. I think it's going to be great for the city of Cleveland,” said Danielle Nodolski. She’s born and raised in the city, loves her town, and wants it to shine during the RNC. When it comes to graffiti, though, she said, “I think it gives a poor impression." In May, we showed you numerous areas that have a ton of graffiti and will be visible to RNC visitors. We pointed out an internal memo from Cleveland City Councilman Mike Polensek asking city leaders to address the graffiti. Plus, we were assured it would be tracked by the city's Building and Housing Department. "I'll follow up when the compliant goes out to the CDC,” said Building and Housing Director Ron O’Learly. Well, many buildings we featured 7 weeks ago still have graffiti all over the place and are still visible from I-90. We tried several times to set up an interview with Director O'Leary. We were told it would be set up, but we didn’t hear back on our request. In our previous report, we also showed you trash in many areas along heavily traveled routes to downtown and even I-71 that is an airport-to-downtown thoroughfare. Unfortunately, 7 weeks later we found the exact same trash in the median. We asked ODOT how that happens. “We've got crews out there doing everything they can to clean up litter all over the city,” said District 12 Spokesperson Amanda McFarland. She also told us there was a successful clean-up day early in June. And there's another planned for this Saturday. She's encouraging everyone to sign up to help . "It's a long-hill battle to try and keep up with that litter," said McFarland. Some areas did get attention like the graffiti on a building in the 3000 block of Lakeside is now gone. Huron and East 4th streets around The Q are getting facelifts. It's part of the work that Nodolski has noticed. "I've seen the transformation and we're at a great point right now and we just need to continue to do that." We asked ODOT about overgrowth with weeds and grass and McFarland told us it's working from downtown out. She also said ODOT has timed out the grass cuttings so that the highways are nicely manicured just in time for the RNC.